Michel Fiffe loves superhero teams with a high mortality rate. 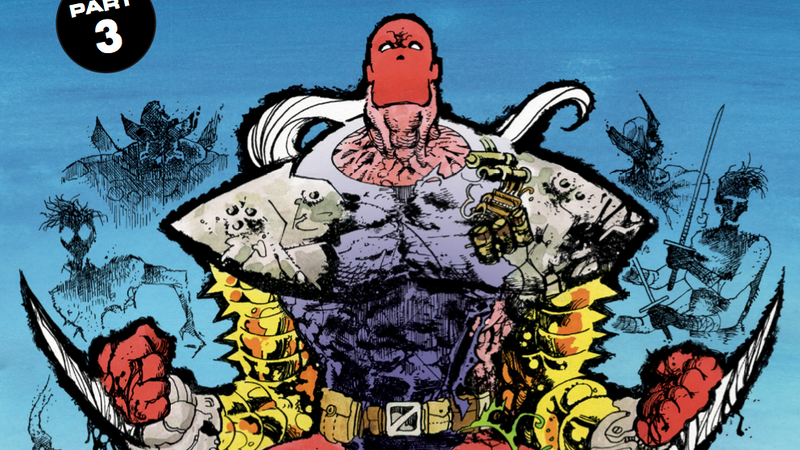 His creator-owned series, Copra, is a love letter to John Ostrander and Kim Yale’s legendary run on DC Comics’ Suicide Squad, and for his latest project, Bloodstrike: Brutalists, he’s reviving a ’90s Rob Liefeld property featuring a team of assassins brought back from the dead by the U.S. government. This three-part miniseries ties up loose ends from the original Bloodstrike series, and it gives Fiffe the opportunity to continue the canonical stories of characters he’s always appreciated, but haven’t gotten much respect from the comics industry and readership. ’90s comics get a bad rap, but Fiffe doesn’t think the art is responsible for that reputation. “We all ate it up and loved it, ‘til we couldn’t love it anymore,” says Fiffe. “We binged, we purged, the industry collapsed. So, while understandable, it’s too easy to pick on the visual flair of the times as a way to talk about the general shittiness back then. Personally, I respond to the sportsmanship, the competitive immediacy of it all; it’s more ESPN than Artforum. It’s a grindhouse aesthetic: bigger, dirtier, irreverent, unashamed.” Readers can check out the conclusion of Bloodstrike: Brutalists in July, but in the meanwhile, here’s an exclusive preview of the third and final chapter, which has the team’s leader retrieving the bodies of his dead companions for one last mission.